Click this cover image to order your copy from Tupelo Press! 2018/2019 Update! 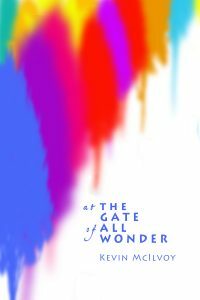 I’m pleased to announce that my newest work, At the Gate of All Wonder (from Tupelo Press), was published in September 2018! For more information, please see my “New Stuff” page! Prices listed below include costs for domestic shipping (5-10 days, continental United States). International shipping costs vary. Added fee – email me! Note: if you’d like your book signed or inscribed with a note you can click on the book’s title, which opens a separate page for the book. From this page you can order the book and indicate the personalization you’d like. In this “carefully wrought” tale of three brothers who grow up in an Illinois steel town, Michael fails to help Matthew, the youngest, stay alive. And Luke, the oldest, fails to keep his promise of hope, leaving college and the family for a vagabond life in New Mexico. PW commended McIlvoy’s “vivid” characterizations and “powerfully rendered” sense of place. Reprinted from Amazon.com. Copyright 1989 Reed Business Information, Inc.
McIlvoy’s title refers to a station of the cross along Christ’s route to Golgotha, and his story describes the collective passion of the McWelt family. With an alcoholic father and a mother who uses religion as an escape, the three McWelt sons grow up supporting one another with powerful but inarticulate love. At the steel mills, on the basketball courts, and in the neighborhood taverns of Meltenville, Illinois, these fraternal bonds are skillfully displayed. After the youngest brother dies inside a foundry smokestack, the two survivors are displaced both physically and emotionally and must forge new lives in the deserts of New Mexico. Though the scenes in Meltenville are strong and moving, those in New Mexico are slightly less effective. Reprinted from Amazon.com. Albert E. Wilhelm, Tennessee Technological Univ., Cookeville. Copyright 1988 Reed Business Information, Inc.
Red Greet, the 85-year-old mason and part-time thief of McIlvoy’s deeply satisfying novel, tells you right at the outset, “I’ve always liked a Bible kind of story that adds on and keeps on adding.” Following that principle, Red saturates his main story, about his love for the two women in his life, Cecilia, his wife, who died 20 years before the book opens, and her friend, Recita, with anecdotes of the local folkloric Catholicism that takes saints and miracles for facts. Red is haunted by the fact that Cecilia’s own affections were divided between him and his best friend, Francisco Velasco, a priest and, in Red’s view, a saint. McIlvoy (Little Peg; The Fifth Station) has beautifully rendered the soft, Spanish-inflected rhythms of English as it is spoken on the border, and Red is the classic picaresque rascal, even though his age endows him with the quasi-biblical stature appropriate to an account of a farming community where families are rooted for generations in each other’s histories. The traditions that give symbolic shape to the great passages in life, birth, marriage, death, still hold weight here. When Francisco gives Cecilia the last rites, Red, who is looking on, realizes that they are consummating their lifelong passion for one another. But Red also recognizes that, in spite of the rivalry, he and Francisco are also bound by a tie of love, which is the sacrament holding Red’s memorable, intelligently romantic story together. Reprinted from Amazon.com. Copyright 1998 Reed Business Information, Inc. –This text refers to the hardcover edition. Red Greet is an endearing and energetic 87-year-old intractable petty criminal who tells his life story “like a coyote spitting up his own bones.” Born and raised in Las Almas, New Mexico, in the ritual and tradition of Catholicism, Red is now newly married to a woman he has loved since before his first wife died some 25 years ago. In weaving the tales of his lifetime, this lover of life and people reveals his longing for salvation–the search for hyssop, a substance with the power to cleanse his soul. Central to the unfolding of Red’s life story is his relationship of more than 70 years with Bishop Frank Velasco, his friend and confessor. With an underlying quality that is decidedly more spiritual than religious, Red’s stories are a celebration of the poignant mix of wonder and wisdom known only to the elderly. There is a gentleness about this book that does not diminish its power, and serves to illuminate the often evanescent connection of faith and ritual to everyday life, love, struggle, and eventually salvation. Reprinted from Amazon.com. As Grace Fill –This text refers to the hardcover edition. Little Peg has been a resident of Everview, a psychiatric treatment center, since 1971, the year her brother Ben died of injuries sustained in Vietnam; by 1988 she has recovered to the point that she can phase back into society. 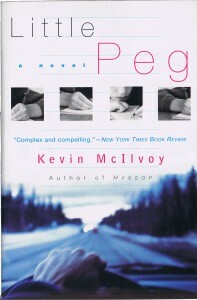 Peg contemplates returning to her estranged husband and the daughter who was born prior to her self-imposed committal; protects close friend and fellow Everview patient Francis; and teaches a creative writing course where she unapologetically replaces her students’ short stories with her own autobiographical work. This disconcerting practice is therapeutic and allows Peg to reveal the details of her breakdown, which she attributes mainly to the situation surrounding Ben’s death; it is the vehicle by which the reader comes to understand (if not sympathize with) her behavior. Interspersed throughout the novel, the stories are Peg’s perceptions of reality and are told from the points of view of Peg, her family and a family photographer, a resourceful method of flashing back although the different voices here have obviously sprung from the same source. 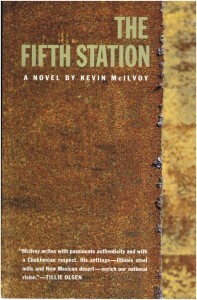 McIlvoy ( The Fifth Station ) has written a reliable, effective account of a disturbed yet stubborn and strong personality. Reprinted from Amazon.com. Copyright 1990 Reed Business Information, Inc. –This text refers to an out of print or unavailable edition of this title. 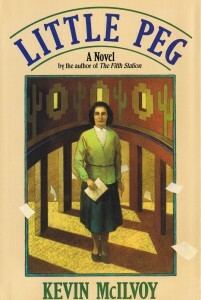 This is the second novel from McIlvoy ( The Fifth Station , LJ 3/1/88), an English professor at New Mexico State University. Peg O’Crerieh Aigley is estranged from her husband, the mother of a teenage daughter, and a teacher of creative writing in a university program for nontraditional students. For most of the past 17 years, however, she has been a voluntary resident of Everview Psychiatric Center. When her younger brother died from injuries suffered in Vietnam and her husband returned from the war unhurt, Peg was unable to tolerate either the loss or her apparent good fortune. Now she rewrites her students’ stories to tell her own history, and in this act of reworking narratives she also takes control of her life. Peg’s situation is somber, but the first-person account of it is witty, gutsy, and insightful. Reprinted from Amazon.com- Albert E. Wilhelm, Tennessee Technological Univ., Cookeville. Copyright 1990 Reed Business Information, Inc. –This text refers to an out of print or unavailable edition of this title. Little Peg has been a resident of Everview, a psychiatric treatment center, since 1971, the year her brother Ben died of injuries sustained in Vietnam; by 1988 she has recovered to the point that she can phase back into society. Peg contemplates returning to her estranged husband and the daughter who was born prior to her self-imposed committal; protects close friend and fellow Everview patient Francis; and teaches a creative writing course where she unapologetically replaces her students’ short stories with her own autobiographical work. This disconcerting practice is therapeutic and allows Peg to reveal the details of her breakdown, which she attributes mainly to the situation surrounding Ben’s death; it is the vehicle by which the reader comes to understand (if not sympathize with) her behavior. Interspersed throughout the novel, the stories are Peg’s perceptions of reality and are told from the points of view of Peg, her family and a family photographer, a resourceful method of flashing back although the different voices here have obviously sprung from the same source. McIlvoy ( The Fifth Station ) has written a reliable, effective account of a disturbed yet stubborn and strong personality. Reprinted from Amazon.com. Copyright 1990 Reed Business Information, Inc. –This text refers to an out of print or unavailable edition of this title. 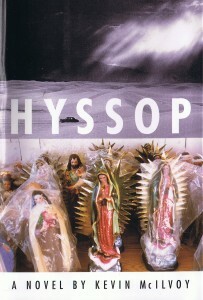 This bizarre, engaging collection by the author of the critically acclaimed novel Hyssop can be split into two distinct parts. Like a series of jazz riffs, a group of 12 (relatively) more conventional stories range widely but keep returning to similar themes. Recurring characters pop up regularly, as do references to blinding of one sort or another and vision problems in general. In “Smoke,” Zack, a boy with a lazy eye, uses his exercises with a rubber ball to try to “see beyond”; in “Rafters,” Zack visits his messed-up relatives and spends a traumatic, exhilarating day installing insulation; in “Permission,” Zack’s cousin Bud, a bartender at the U Dam Right, meets a bar magician who changes his life. Even odder than these stories, but more focused, are three separate, interrelated reports on the history of New Mexico, which together make up the title novella. The fictional author is one Charlemagne J. Belter, an 11-year-old in public school in the state. Charlemagne (or Chum, as he is called) isn’t much of a student, but as a narrator he is beguiling and good-humored (“I got into sixth grade but almost not”), mixing dubious schoolbook history with grim, touching anecdotes about his best friend Daniel. Peering over Chum’s shoulder, the reader is treated to a weird, haunting view of his world in this uneven but occasionally mesmerizing collection. Reprinted from Amazon.com site. Copyright © Reed Business Information, a division of Reed Elsevier Inc. All rights reserved.